This is the Hoopnotica travel hoop kit. You can buy it at CVS. 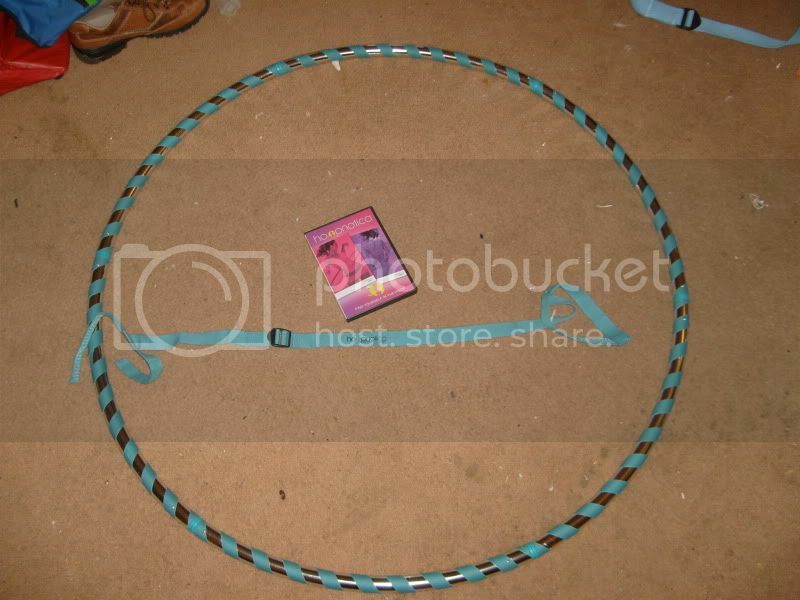 It contains: 1 travel hoop, 1 strap, and level 1 + 2 Hoopnotica DVDs. It was about $40. I felt like it was worth it just for the DVDs. I bought it when I was really struggling. This hoop is heavy but it's only 42" or something big. It is heavier than my homemade hoop by my friend. It has a mirror tape and a cloth tape with 4 connectors. One of the connectors was harder to insert. I would have to wiggle it in. To remove it, I suggest using some sharp, sturdy object to push into the button. I use my car keys. That one part of the hoop is also really hard to undo. I have to wiggle it out. I've had the hoop in my car for a week. I've mainly used it once or twice this past few weeks. I just noticed that some of the mirror tape is shredding. It's really heavy hoop for isolations. It's okay in a pinch. Because of the limited sizes available (there was a plus size version on the website), I couldn't really hoop with this hoop. That's my issue due to my girth and beginner status. Also, my friend likes to use this hoop (because of the size) except for the weight. You see she has had the lap band and she tells me that it hits it/makes it hurt mainly due to the weight. It also clicks when you hoop! The DVDs are good. They cover basic hooping. Waist hooping, hip hooping, halos, corkscrews, knee hooping, and some other stuff I've yet to explore. I like the trouble shooting. I just sometimes wish that the waist hooping was more defined in the menu cause it just keep playing on when I needed to review waist hooping more. It was frustrating for me to go back. Also, you have to fast forward to go to the trouble shooting. Although I loved Teagan doing it. She actually made it seem hopeless which was just how I felt! Hoop- 5/10...It's not bad but it's not good. If you are desperate and in a fix, get it. DVDS- 8/10 ...good as long as you have the proper space to watch it with your hoop.